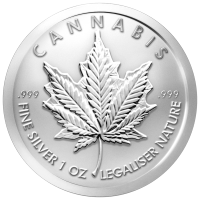 Stříbrná mince Konopí 2015, 5 oz Say what you want but the Cannabis silver round was one of the most sought after rounds of the entire series. These rounds are made to look like a Canadian maple leaf silver coin. The word Canada is replaced with Cannabis, and it looks as though a marijuana leaf has been struck over top of a maple leaf. The release is a very limited run, and is only scheduled to be in production for one month.